After years of talking about it, being frustrated, tired, sore, isolated, teased and “trying”. It finally happened. Carlos has been weaned off of “ninny” and I’m free of breastfeeding! Quick, someone hand me a beer! Not only am I not limited to how many I can have or at what hour I need to stop let’s be honest … this is a victory (for me anyway). When Carlos turned one, every night during prayers I would tell him soon he wouldn’t have milk and how he really didn’t need it anymore. He was a big boy and how he could have milk or water in a cup. Every night he agreed by shaking his head that he understood. But, when push came to shove he didn’t follow through with our plan. For two years I tried telling him he was a big kid but every afternoon and night he would want “nin” to go to bed. And while breastfeeding is extremely easy, its that easiness that can get you in a deep whole of dependence. Hurt? crying? tired? here have some milk! When the answer is right in front of you (literally) it’s easy to just do it. After feeding during the night he would wake up and want “nin” right away, and it was even to the point that he would cry about it. It was exhausting to be a prisoner to it. As much as I loved feeding him and bonding it was too much. Luckily my husband was very supportive and we didn’t feel a need to force him to stop but we agreed that he should stop before the age of 3 (which at this point was a month away). I could handle him crying but the real question was could the rest of the family deal with it in the middle of the night? The Thanksgiving break seemed like my one and only shot and getting this right. Emery was out of school, little Victor wouldn’t be home and maybe we could politely ask dad to leave the room for the week while I learned how to put a baby to bed without milk. First night was a disaster. I almost gave in. Carlos was screaming his head off … and when I say screaming I don’t mean crying really loud, I mean sitting there full force screaming until he got his way. While I ignore the sound, dad has a harder time letting go of control and I was in between two alpha male personalities howling at each other (wow, that sounds much nicer than it was). Eventually the screaming subsided, he asked for an orange (normally I would not give him food late or in bed but if it was to calm him down, sure take an orange) and he fell a sleep. He woke once asked for it and went back to bed. Hallelujah! The next few days followed suite, but with less screaming. He hasn’t taken naps unless they are in the car because I don’t know how to give him a nap with out milk and he wont take a nap during the day. Once a day he’ll ask for “ninny” jokingly or just to say it but doesn’t fuss or bother about it. How fast he was weaned has been amazing. Still nights can be hard and I think if he was breastfeed he would be a sleep right now and I could do my crafting or be out of the bedroom instead of him forcing me to be in the room with him. 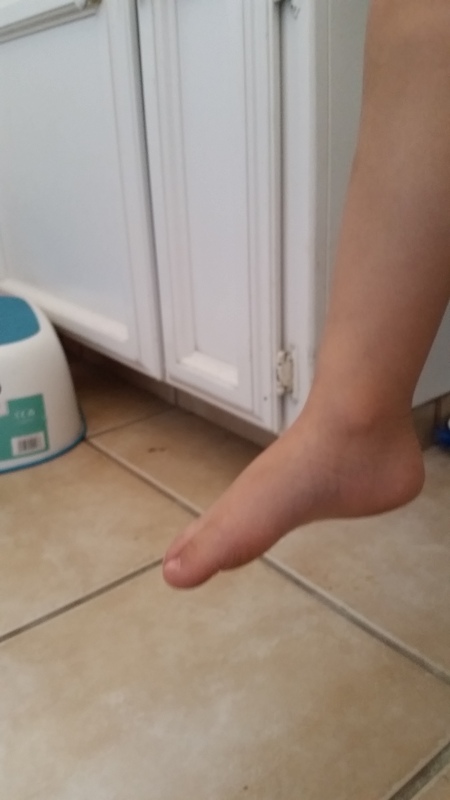 That is our newest big struggle, and personally I feel some what useless now; Carlos has made huge strides in the past 3 months, potty trained and weaned … where do I fit in? My baby is now a big boy … something I wanted but now that it has happened I feel kind of empty. I see him tired but I cant help to put him to bed, he’s hurt and I cant comfort him like the way I know how and lately I’ve had a hard time sleeping. I wake up at night and I see everyone sleeping comfortably and all through the night and I’m tossing and turning wanting to feed someone haha. Maybe not that last part but I think I am use to wake up several times at night that I’m finding it weird to just be me again. Two weeks ago I decided to potty train Carlos using the one week trick. I finally had a week where we weren’t running around all day doing errands. Carlos is the same age Emery was when she stopped wearing diapers. I didn’t blog about potty training Emery but she was half way potty trained at 2. Then I got pregnant and really sick and she back peddled big time. Once Carlos came I had a rough time changing two kids. One day I got really upset about having to stop and change her pooped diaper before leaving the house. I said what I had to say at home and once we got into the truck it was over. While I drove to my mom’s house Emery brought up how she was sorry about pooping herself. I mostly listened and she said, “I’m deciding to not poop or pee in the diaper anymore“. Of course I thought what a wonderful idea and from that conversation she never did. Once Emery sets her mind to an idea she does it. I’ve only ever heard that a boy is harder to potty train. Well, if Emery basically just decided to go at two, I figured I had some actual work cut out for me. There are many methods and techniques. Carlos didn’t fit into the mold of watching his reaction and running to the restroom. He was really nonchalant about the whole thing. I decided the best thing for us would be bribery. What? Is that bad? 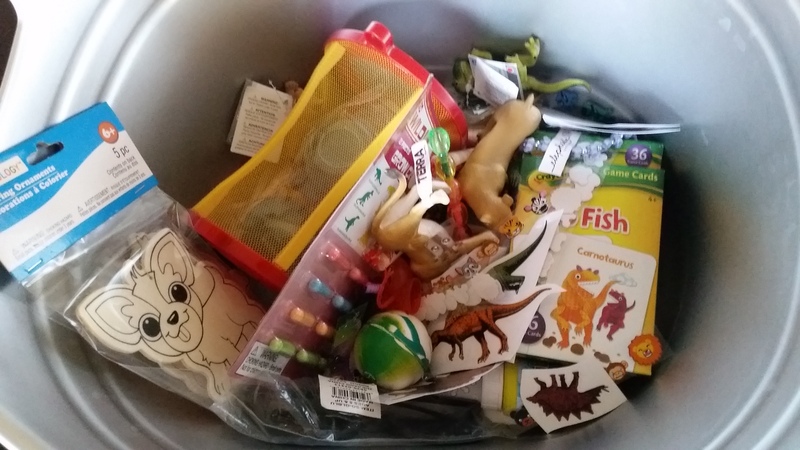 We made a Target trip Friday morning after dropping Emery off at school, and got lots of toys in the dollar section. 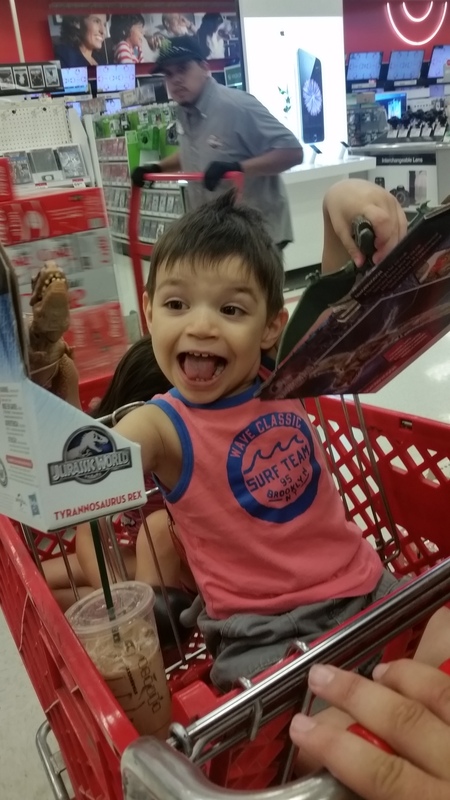 For some reason we made our way to the toy aisle and Carlos fell in love with a big T-Rex toy. 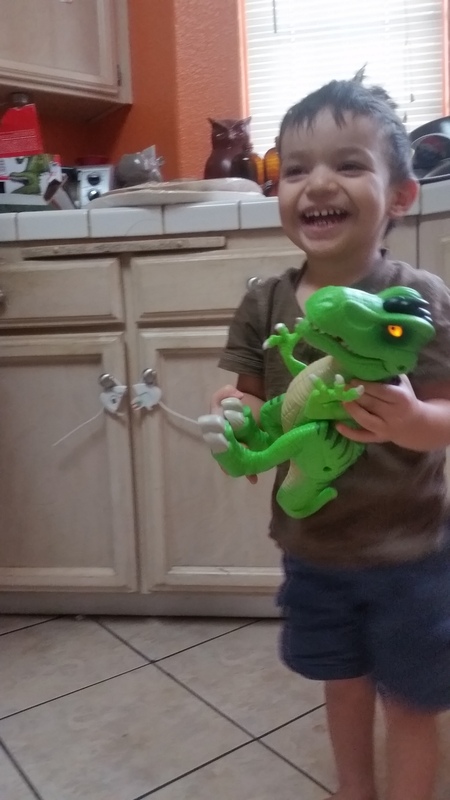 Carlos loves a lot of things but one of his favorite things are T-Rex dinosaurs! Of course it came with a little price tag so we talked it over and decided this toy would be our, no more diapers reward! Carlos knew and told everyone he wanted the big T-Rex toy and he had to poo poo toilet to get it. I like to use the toilet seat top instead of the little fake toilets when I potty train. I feel like it gets them ready to go on the big toilet so its not intimidating especially when you have to do a store potty run. Also, I don’t like the idea of dumping crap out of a poop bowl and having to wash that. Kinda defeats the purpose of me having a little break from changing diapers during the process. 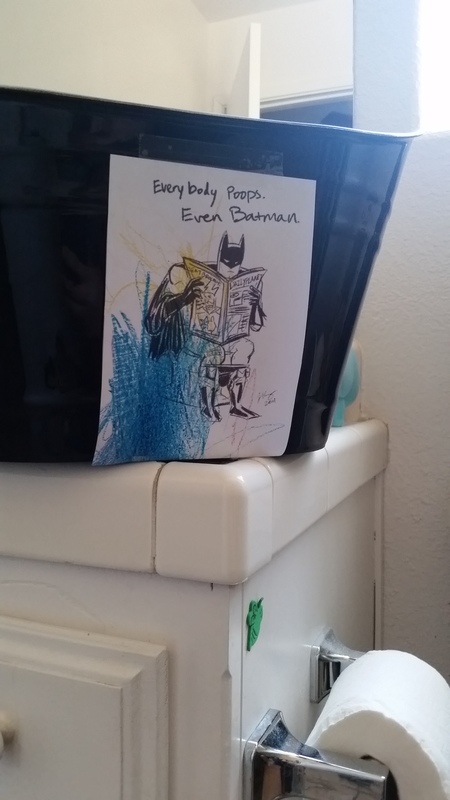 On Monday I printed out a Everybody Poops cartoon image of Batman (his favorite super hero). 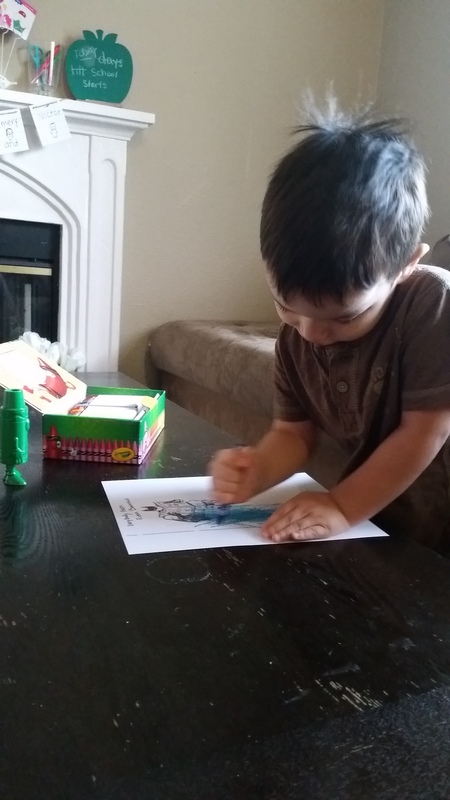 We talked about how he is using the restroom and Carlos colored it. Before Monday the family spent months saying how we all go poo poo toilet and don’t pee pee our pants. I used our newest cousin baby Dominick as an example as a little baby who needs diapers. I felt like that was me trying to shame him so I used that example with caution and tried not to use it with anger. 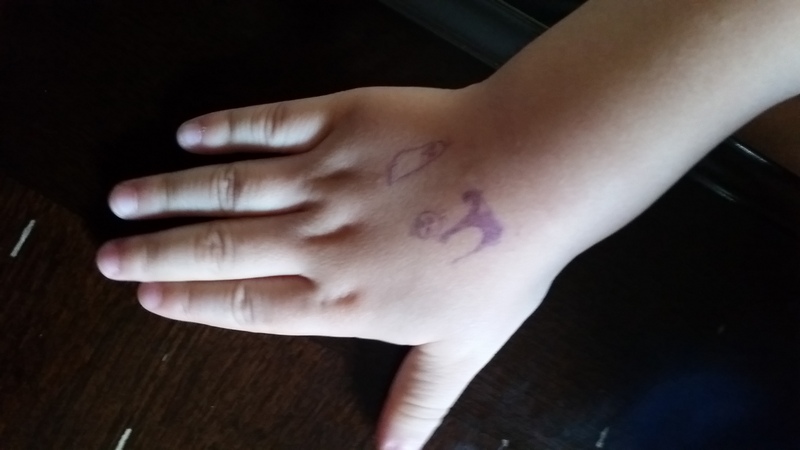 All set up, each time Carlos went to the bathroom he would get to pick his reward or get hand stamp! Found some goodies at Michaels summer clearance section too! There was a few little bumps in the road, one or two pee accidents in the beginning and about 4 dirty underwear and 2 poop on the floor incidents. One of them happened one morning when I was cleaning the house and didn’t check on him. Luckily it was a super easy clean up, he was sorry (his classic “sorry mom. sorry again mom” line) and we both learned something. He would try harder because big boys don’t poop themselves and he couldn’t get his T-Rex reward if he pooped his pants. I learned Carlos is a morning dropper. When Emery was in school Carlos would be with out pants so he felt awkward and didn’t have that security to want to have an accident in his underwear. Any time we left the house I had his little seat in a tote with us. We took it to Papa and Grandma’s house and to gymnastics. I didn’t want to have to put him in a diaper at all (besides bed time) and have him confused or only potty training half the day. Within the first week he got the hang out it and pooped underwear where a thing of the past. He caught on so fast it surprised us. We made a second trip to Target to refill his bucket. 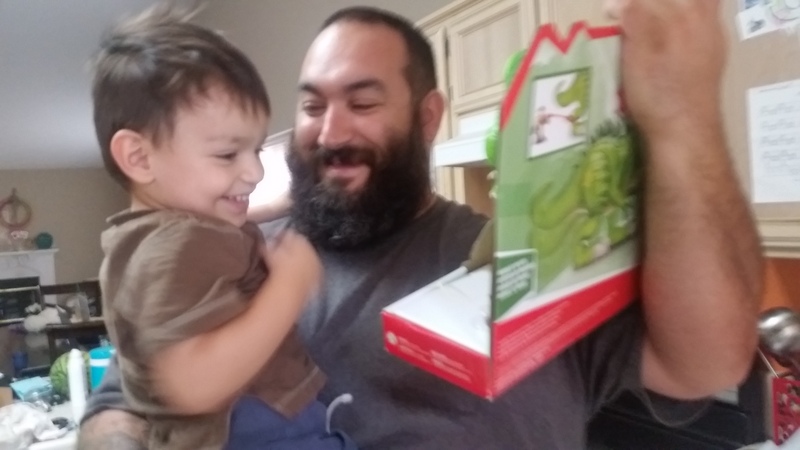 Carlos also got a small T-Rex toy for finally going poo poo toilet (which is the hardest part of potty training). He also has been taking his nap with no bottoms on or in his underwear without any accidents. I find that to be really impressive. The hardest part I would think, would be teaching a child not to pee at night but I am super lucky that both Emery and Carlos (knock on wood) have never given me any trouble with peeing the bed (something I struggled with as a child). After the second week of potty training and consistent poo poo in the toilet use, Carlos earned his big reward! Dad surprised him with his big reward after his nap! Have you ever seen a child so happy? You earned it kid! So two weeks later, I am making it official, my child is potty trained! A major milestone in becoming a big kid. While I don’t miss changing diapers it’s one more thing making me realize he’s our last little baby and he’s growing daily. I’m proud of you kid!